The third quarter was the best-performing quarter for markets so far this year as the major U.S. stock indices each hit new all-time highs. The broad market gains were driven by strong economic data, solid earnings growth and improved clarity on global trade. Regarding global trade, concerns about the U.S. and Chinese trade relationship remain, but the third quarter also saw important resolution to numerous other trade situations. First, in July, the United States and the European Union reached a trade agreement that would prevent retaliatory tariffs, and promised to investigate ways to further promote free trade between the U.S. and the E.U. Then, in August, the United States and Mexico agreed to a trade framework to replace NAFTA, and on the final day of September, Canada and the United States reached an agreement for Canada to join the existing U.S./Mexico deal, settling another potential trade dispute. So, we started the third quarter of 2018 with four areas of trade-related concerns: the EU, Mexico, Canada and China. Positively, we begin the fourth quarter with just one area of legitimate trade concern: China. While the U.S./China trade relationship certainly represents a potential risk to the global economy and markets, it’s important to remember that so far in 2018, a strong U.S. economy and healthy corporate fundamentals have powered stocks higher through multiple periods of trade, political and international uncertainty—and that’s critical context to consider as we enter the final quarter of the year. The major U.S. stock indices surged to new all-time highs and there were broad gains across most market segments and sectors in the third quarter. Improvement in the outlook for global trade was an important positive catalyst for market performance in the quarter, and that was reflected in the monthly market returns. Strong market rallies in July and August helped U.S. stocks finish the quarter in solidly positive territory. By market capitalization, large caps outperformed small caps, a departure from the first two quarters of 2018. That change in performance is representative of the reduction in global trade risks, as large caps underperformed small caps during the first half of 2018 primarily because of trade concerns. From an investment style standpoint, growth once again outperformed value, as strong tech sector returns continued to help growth styles outperform, which has been a consistent trend all year. On a sector level, ten of the 11 S&P 500 Index sectors finished the quarter with positive returns. Healthcare and Industrials outperformed the S&P 500 thanks to earnings from healthcare facilities while Industrials were aided by reduced trade tensions. Conversely, the Energy and Materials sectors fought headwinds from a stronger U.S. dollar, and that caused both sectors to relatively underperform the S&P 500 Index. Meanwhile, Communication Services was the lone S&P 500 sector to finish the quarter with negative total returns. Internationally, the third quarter was the first positive quarter for foreign markets in 2018, aided by a September rebound fueled by a reduction in concern over Italian budgets, Turkish inflation, and U.S./China trade. However, foreign markets still lagged the U.S. market. Foreign developed markets registered small gains while emerging markets, despite a strong rebound in late September, again closed firmly in negative territory. Most major commodities indices were positive in the third quarter, once again aided by a rally in the energy complex. Oil surged higher in the third quarter, reaching a new multi-year high thanks to continued geopolitical unrest in the Middle East, and a lack of oil production increases from OPEC. Gold again underperformed, with prices falling to the lowest level since early 2017 due to a lack of acceleration in inflation. Turning to fixed income, the leading benchmark for bonds (Bloomberg Barclays US Aggregate Bond Index) was very slightly positive in the third quarter, although it remains solidly negative year to date. Continued strong economic growth, a reduction in political stress in the European Union and a September Fed rate hike were headwinds on the broad bond markets in the third quarter. Looking deeper into the bond markets, there remained a clear preference by investors for shorter-duration bonds, as one-to-three-month Treasury bills again logged a positive quarterly return. That makes sense given the Fed just hiked rates for a third time this year, and clearly signaled it intends to raise rates a fourth time in December. Finally, high-yield bonds returned a second consecutive quarter of positive performance as bond investors remained focused on strong corporate fundamentals and solid economic growth. 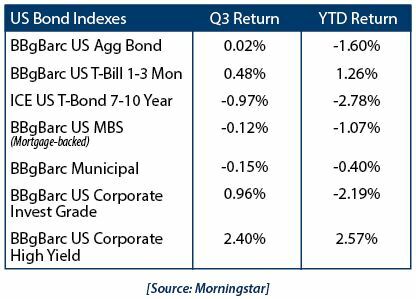 High-yield bond performance remained decidedly positive on a year-to-date basis. As we start the final quarter of 2018, U.S. economic and corporate fundamentals remain very strong, and those two factors combine to provide firm support for the markets. It’s unclear how, or when, these events will be resolved, and what those implications will be for markets. Yet as 2018 has shown us so far, uncertainty is not, by itself, enough to offset the strong fundamentals in the U.S. economy and corporate America. Instead, these and other market uncertainties require an intent focus on financial markets, economic data and political news. Put more generally, markets always face uncertainties at the start of a new quarter, but over the long term, core economic and corporate fundamentals drive market returns, not the latest sensational headlines. At Krilogy Financial, we understand that volatility, whether it’s related to trade disputes or concerns about government policy, can be unnerving, even if it is historically typical. That’s why we remain committed to helping you navigate this ever-changing market environment. As 2018 has shown us so far, trade conflicts, political dramas and short-term market volatility are unlikely to impact a diversified approach set up to meet your long-term investment goals. Therefore, it remains critical to stay invested, remain patient, and stick to a plan. Thank you for your ongoing confidence and trust as we navigate this changing market environment.